In a saucepan, bring 1 quart water and 2 teaspoons salt to a boil. While water heats, prepare broccoli: trim off tough stalks (see TIP). Slice broccoli heads and any attached stem lengthwise into strips. 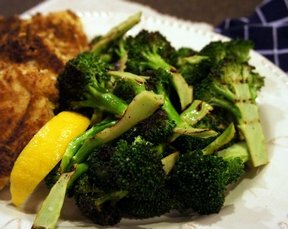 Drop broccoli into boiling water and cook, without covering pan, until just tender, 3 to 5 minutes, depending on size of pieces. 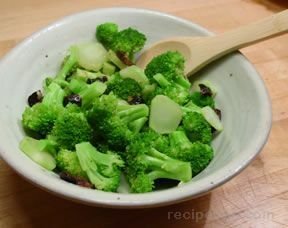 Drain broccoli and toss with lemon juice and olive oil in a bowl. Add salt and pepper to taste. 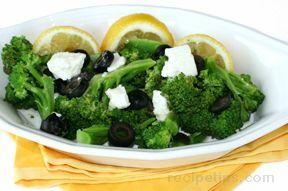 Scatter olives and pieces of feta, if using, over broccoli and serve. 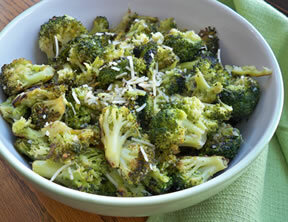 TIP: Broccoli stems are delicious when peeled to remove tough, fiberous skin and can be used raw or cooked.